Raaga.com: Raju Hirani – The director with Golden Touch! The 50’s and 60’s witnessed legendary filmmakers like Bimal Roy, Mehboob Khan, Guru Dutt and Raj Kapoor, who had the amazing potential to infuse art and commercial elements in the making of a movie thus making potboilers like MADHUMATI, MOTHER INDIA, PYASA, AWAARA etc. Decades later Rajkumar Hirani better recognized as Raju Hirani has attained the same credentials as the above mentioned legends. His movies have the same ingredients that keep people in splits straight till the end with just the right amount of emotions. November 22, marks the birthday of Raju Hirani , who is making waves these days thanks to his upcoming movie PK. Raaga.Com wishes Raju Hirani happy returns of the day and pray he continues to entertain with quality cinema. 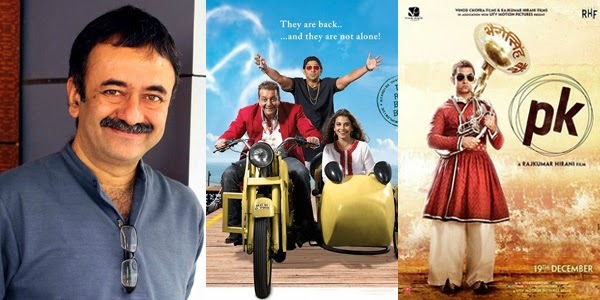 Readers would be surprised to know Raju Hirani is perhaps the only film director in Bollywood who has the prestige of giving a hat trick of successful films viz. MUNNA BHAI MBBS (2003), LAGE RAHO MUNNABHAI (2006) AND 3 IDIOTS (2009). Even the legendary Bimay Roy could not achieve this feat. His first two films PARINEETA (1953) AND DO BIGHA ZAMIN (1953) were super hits but his third film NAUKARI (1954) was a dud at box office. With PK Raju Hirani’s credentials are at stake because if he hits the bull’s eye yet again at the box office with PK then he will prove why he is called- The director with golden touch!